Ten journalists from both the print and electronic media have been awarded tourism fellowship for their significant contributions to tourism sector’s development and encouraging others to work more on the growing sector. Bangladesh Tourism Board (BTB) and Aviation and Tourism Journalist Forum of Bangladesh (ATJFB) jointly arranged the fellowship programme, reports UNB. The fellowship recipients are Shariful Islam (The Daily Star), Saifunnahar Sumi (The Daily Observer), Altab Hossain (The Daily Samakal), Rabiul Islam (The Daily Sakaler Khabar), Abudullah Tuhin (Jamuna TV), Parvez Reza Chowdhury (Ekattar TV), Ashraf Alam (Independent TV), Baten Biplob (SA TV), Musfiqur Rahaman (Mohona TV) and Afrin Jahan (BTV). 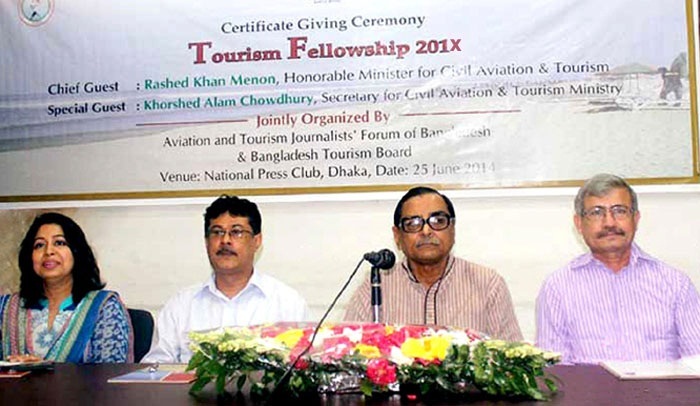 Civil Aviation and Tourism Minister Rashed Khan Menon handed over certificates and cheques (Tk 60,000 each) at a function held in the city on Sunday, said a press release. He said connectivity is the main barrier towards boosting tourism in the country. BTB chief executive officer Akhtaruz Zaman Khan Kabir, BTB director Nikhil Ranjan Roy, ATJFB president Nadira Kiran and general secretary Tanzim Anwar also spoke on the occasion.